Everything else can easily be bought in Vietnam for a lot cheaper than back home. 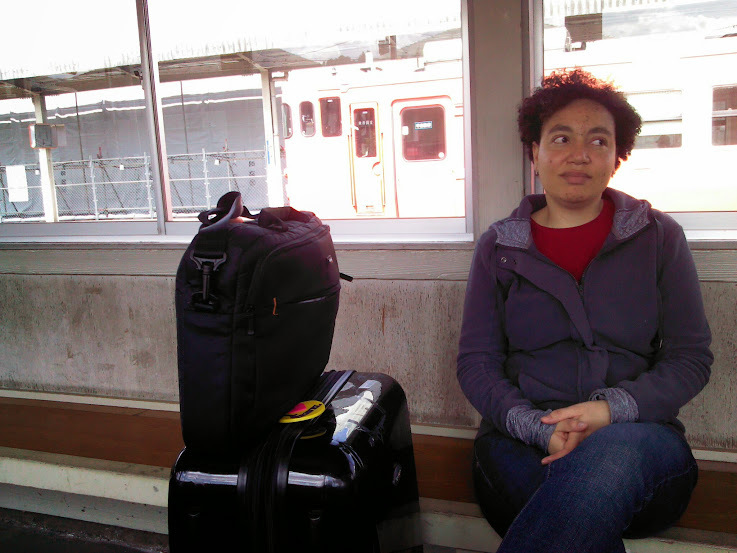 Would you rather carry up a backpack or a suitcase? Bring a backpack instead of a suitcase. Many hostels and hotels don’t have elevators making suitcases, even carry-on spinners, awkward to handle. A backpack can be purchased in Hanoi or Ho Chi Minh City for a faction of the usual price. Look at several shops that sell just backpacks before buying a pack. You could bring just any old duffel bag and throw it away when you buy a backpack here. You can buy lots of clothes here at a fraction of the usual price. Larger sizes are harder to find. So, if you are taller or chubbier than average I would not depend too heavily on finding lots of clothes. Many pants are unisex and one size fits most. You might not find your usual style. You will look like every other backpacker, unless you shop at malls which only carry smaller sizes and have less discounted prices. You will need to have at least one short sleeved (non-tank top) shirt and one pair of shorts or a skirt that covers your knees to enter some temples. This is true for men and women. All hotels and hostels provided guests with towels. Some, not all, even provided 2 towels, one for showers and one for the beach. You might bring a towel for use at the beach. All hotels and hostels provided guests with shampoo and body wash. Sometimes I didn’t like the shampoo or body wash so I bought my own. You can buy shampoo, conditioner, and body wash in Vietnam. You can find this here, but the brand selection is limited. It’s mostly Dove, Nivea, and other brands I’ve never heard of. It’s mostly Banana Boat and Nivea. Many (not he Banana Boat brand) come with “skin whitening” (whatever that means). You can buy shampoo, conditioner, body wash, deodorant, and suncreen at a convenience store, but they will be cheaper at grocery stores. Grocery stores will have more variety, too. Walking slowly will cause a taxi driver to ask if you need a ride. They are all metered and cannot be turned on without turning on the meter. In the past taxi driver’s in Vietnam were very sketchy, but the government intervened. People say that Uber is cheaper, but taxis here are very cheap and it’s so damn easy to hail a cab. You can stop one accidentally by waving to a friend, scratching your head, or standing on the sidewalk for too long. Some cabs come with free wi-fi. HSBC (free I think) and TechCom (66,000VND ~ 3USD) Bank has the lowest rate. Just watch out for overpriced things. Even overpriced items are cheap when compared to prices back home. Overall, almost everything in Vietnam is inexpensive. I had to used the phrase “expensive for Vietnam” to clarify the prices of things. If you need a visa to enter (Americans do) get a visa beforehand to save time. Visa at the airport (you did nothing beforehand) — 2 to 3 hour wait or denied entry. One problem with long term travel is the constant planning. We go to a new city or town and have to think of things to do. If we’re lucky, the city is known for something. “If you go to Paris, see the Eiffel Tower.” “In Rome? See the Colosseum.” But what happens when you go to, say… Ho Chi Minh City? Instead of lollipops we get fruity drinks, ’cause we’re adults! We started our RTW Trip vaccines in Japan. By May it was time for the next round of shots. We first went to the Institut Pasteur in Nha Trang, but I got freaked out when I saw the doctor treat patient after patient without washing his hands, using gloves, or using alcohol to clean the area where the shot was given. Even though we had signed up for shots, I grabbed Mark and ran out of the clinic before seeing a doctor. Back at the hostel, I talked with a doctor. Well, he wasn’t a doctor-doctor. He was a doctor on paper. He had his degree; he just hadn’t done his residency yet. He would do that after backpacking through South East Asia. He told me, that it was better to get the shot than not, even if the doctor didn’t ever wash his hands or use gloves. He did suggest that I bring my own alcohol wipes and clean my arm myself if the doctor didn’t. Rather than go back to Nha Trang’s Pasteur clinic, we went to Ho Chi Minh’s. They didn’t use gloves or do any hand washing there either, but they did slather bales of cotton soaked in alcohol on each and every arm before and after each shot, so there was some measure of comfort. I called Mimmu to ask her if she made it safely to HCMC and what her plans for the next day were. Mimmu thought it sounded like a wonderful idea. She let me have 2 hours to put the whole tour together while she terrorized some Japanese girls in her dorm with her in-your-face Finnishness. What exactly Mimmu did, I’m not sure (and neither was she), but she assured me that one of the girls seemed dreadfully afraid of her every time she entered the room. So, I went on google maps and made a walking tour. I tried to gather as much information as I could, but it was only 2 hours. And while Mimmu was inadvertently harassing her roommates, I spent about half an hour getting to know one of mine and had invited her to join my badly planned tour. In the end, we all had a wonderful time walking around the city. We posed here and there and everywhere while asking each other about life back home. “Have you ever toured Paris?” I asked Gabriel, my roommate from France. “No,” she said. “I live there, so I don’t go sightseeing. That’s for tourists. Have you ever toured Tampere?” She asked Mimmu to prove her point. “No, there is nothing to see there,” Mimmu answered. Mimmu nodded thinking fondly of her home. This day, Mark did the planning. He picked a history museum and a botanical garden. The museum was nice, but the botanical garden turned out to also be a zoo. The zoo didn’t take care of its animals very well. We had to leave when it got too depressing looking at scrawny, mangy lions and other animals that were locked up in cages too small for them. We made our way to the Ben Thanh Market. It had a vast array of things for sale. We walked around while all the shop keepers tried to entice us to buy their products. It was very crowded and the sales people were very aggressive. None of us wanted to buy anything, we just wanted to look around, but no one would leave us in peace. We didn’t stay long. We found ourselves at Sense Market. It was a smaller, better organized version of Ben Thanh Market with part of a western styled mall thrown in for comfort. We ate dinner there then looked around at the stalls. There was still pushy shop keepers calling to us, but they weren’t too aggressive. I made a food tour. I had a list of foods to try in Vietnam. I still had a few items on the list that I hadn’t eaten yet. I wanted to knock them all off in one day. I didn’t find all the places; some restaurants aren’t where google maps say they are. But I found all the dishes even if I had to get them from alternative shops. We didn’t have breakfast or lunch. We ate here and there and there and here. In the afternoon we visited the War Remnants Museum. The place is depressing, it’s heavy, it’s awful, and, unfortunately, it’s very necessary. War is not glamorous. It is not heroic. It’s seldom black and white. There is never a real winner. There are always many losers, even years and decades afterwards. Usually, everybody is in the wrong, some more than others. I know. It’s a Hanoi dish. But, it’s my favorite Vietnamese food. This was the last thing I ate in Vietnam before getting on a bus to Cambodia. There are many places in HCMC that serve Hanoi style bun cha and I tried as many of them as I could find. They were all delicious. When I go back to Vietnam, bun cha will be the first thing I eat! You can get here by train, plane, boat, or bus. Tan Son Nhat International Airport. Watch out for taxi scams. 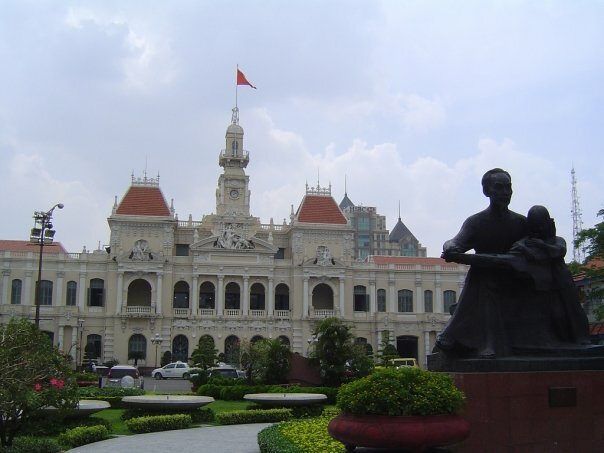 Cho Ben Thanh Bus Station – This one is downtown and near many tourist sites and hotels. Why do Vietnamese people like Louis Pasteur so much? The shots I got cost 755,000d or 33USD. I went there for Hep A&B, Japanese encephalitis, and Typhoid vaccines, not medical care. What I got cost 755,000d or 33USD. There might be other vaccines, but these were all I asked for. From start to finish my whole visit took 45 minutes. The person giving the shots did not wear gloves or wash his hands between serving different patients. Bring a hand fan and some ice water. More if you get lost. Less if you run. There are other statues along the way, but I don’t have any information about them. There is nothing made of Jade here. It was just named after an emperor who was nicknamed the Jade Emperor. President Obama once visited this temple. Most of this museum is not air conditioned. This place has very little garden; it’s mostly a zoo. This is a terrible zoo. The animals are not treated very well. Daily 6:00 –24:00 unless it’s closed at 19:00 for “reasons”. This place is very crowded. The sales people are quite pushy. There are shops with reasonable set prices and stalls where you can haggle. For those who don’t like crowds or very pushy sales people, this is a great alternative to Ben Thanh Market. The food court, which is more like a regular western food court, is quite nice. Couldn’t find this particular stall, but we found another one that served goi cuon. It was delicious, but I didn’t like the dipping sauce. This was the most delicious thing I tried on this tour. I still have cravings for these treats months after leaving Vietnam. The pancakes were overpriced here. You could go to many other places for better prices. Some random convenience store for charcoal ice cream. Very delicious. Not sure how long this will be offered. Most of these dishes were very inexpensive and for the one exception, there is a better and inexpensive version. I tried to keep things simple and inexpensive. I only went to the fancy mini pancake place because, looking at it online, I didn’t realize how expensive it would. War is depressing. This museum is heavy, but very imformative. There are many ways to make new friends while traveling. The easiest way is to start by looking around your hostel dorm room. Most of the people who I have befriended and stayed in contact with, I’ve met because we stayed at the same place during the same time. It’s the easiest way for me, because I don’t feel rushed into a friendship. I’ll see someone several times over a few days. We can have short conversations here and there. If we like similar things, we could even hang out together or go sight-seeing. I wouldn’t go so far as to call myself an extrovert; I just need time to feel comfortable around new people. Another way to make new friends is by joining a tour group. These can last for a morning, an afternoon, or a day. The method is a little harder for me. Unless the people I’m with are a lot more outgoing and proactive than I am, after the tour ends, there is no further contact. We may all have a great time, but no e-mails or Facebook information will be exchanged. Mark and I haven’t stayed in a hostel since Hue. Living in hotels can become a bit isolating. The accommodations are generally nicer, on the whole, but way more effort has to be put forth to be social. You cannot just sit on your bed and start conversations with strangers like you can at a hostel. Mark and I tried to meet new people on a day tour of Mui Ne, but nothing came of it. We had a great time and met some nice people from France and Canada, but then we never saw them again. At no point during the tour did it feel natural to ask for anyone’s contact information. Not only would it have come off as rushing the relationship, but I didn’t even have enough time to know if I even wanted to keep in contact, even for a few weeks after the tour. This photo is so fabulous, I’m going to have to use it at least twice on this blog. Then one day in Mui Ne, walking up the hill to our hotel after swimming all afternoon we heard someone call out to us. “Hey! I know you guys.” We looked around, at first assuming that who ever was mistaking us for someone else; no one, in Mui Ne, knows us. It was our friend Mimmu, whom we met our first day in Vietnam. She had the bunk right next to Mark’s. 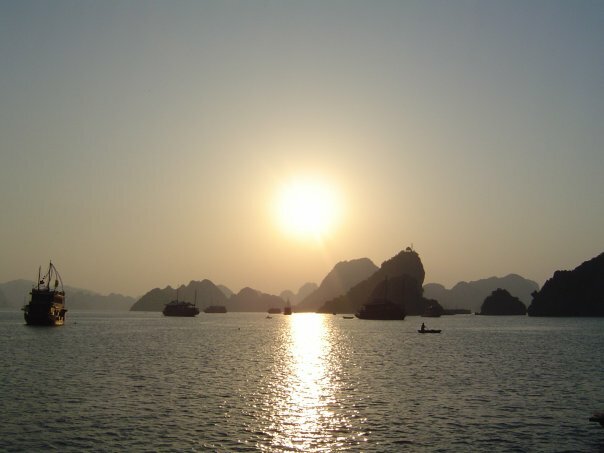 We talked about all the things we planned to do and see in Vietnam before we took off to Ha Long Bay and she headed to some national parks. We sat down together and filled each other in on what we had done on our travels so far. Without realizing it, we had been following each other for the past month, us missing her by a day or the other way around. We were all headed to Ho Chi Minh City next. This time we would meet up and sight-see together. Mui Ne has no bus or train station. So here are your options. Take the train to Phan Thiet Railway Station. The train station is the last stop, so jump on any red #9 you see. There are sleeper buses and tour buses that will deliver you close to your hotel in Mui Ne. Depending on where you go, the beach might be hard to get to. Sometimes you have to walk around several resorts to find an alleyway to the beach. Taxis are not that expensive, especially if you take just one or two rides. Still, keep an eye out for buses to keep costs down when traveling around town. You can take a taxi, rent a scooter, or join a tour group. Most hotels in the area can help you find a tour group. If you’re on a group tour, this fee is included in the tour cost. You don’t need to pay extra. It’s best to go around sunrise. It’s pretty, but if you’ve ever been to any other dunes before just skip this. All dunes look alike. Renting a quad bike is quiet expensive and not in a “for Vietnam” way. If you’re going to rent a sled to slide down the dunes, do it here. The Red Sand Dunes are not as good for sledding. Don’t expect peace and tranquility here. It’s very noisy with so many people getting quad-bike rides to the top of the dunes. These dunes are a lot smaller than the white dunes. Personally, I was not very impressed with these dunes. You can see more red sand along the Fairy Stream. From the middle of Mui Ne, you can take the red #9 bus. This is the same bus that goes to the train station and Lotte Mart. 10,000VND to leave shoes on a rack. You could also carry your shoes with you for free. Always open, but it’s best to go when the sun is up and you can see where you’re going. This was by far my favorite thing in Mui Ne. Even if you think it looks great in the photos, it doesn’t look as nice in photos as it does in person. If I were to do it all over, I would skip the dunes and just do this. I went with a tour group, so I couldn’t spend as much time here as I wanted to. Wear flip-flops and put them in your bag when you walk in the stream. That way, you don’t have to exit the stream where you enter. Bring money. There are lots of smoothie and drink stands along the way and restaurants a little off the path. There are many signs telling when you’re near a restaurant. There are some exits along the stream that lead to taxi stands. There might be people willing to boat you around for a fee. This is not worth a stop. The place stinks (probably from rotting fish left out too long) and there is trash all around. There are better fishing villages in Vietnam to visit. Mark is the one who works out the logistics of travel. He figures out how we get from point A to point B. He finds the hotels and books them. Before we left for Nha Trang he asked me which I valued more, cheap accommodations, clean accommodations, or being close to the beach. The more you have of one, the less you have of one or both of the other two. I couldn’t decide which I wanted more. Clearly the more money we save, the longer we can travel. If we run out of money after a few months of traveling, we will have to stop and get jobs. So I really needed a cheap hotel. But, I didn’t want to stay in a dump. I like being in a clean hotel. I don’t want to sleep on dirty sheets with questionable stains or odors. I hate moldy old bathrooms that leave be feeling more icky after taking a shower. The room doesn’t have to be fancy, but up to a normal level of clean. On the other hand, Nha Trang beach was supposed to be one of the best beaches in Vietnam. It wouldn’t do to be so far from it that it was too much trouble to go see it. We did that in Hoi An. We never even set foot on any of Hoi An’s beaches and the regret of that weighed heavily on me. “Let’s get the cheapest place near enough to the beach that we can still walk to the water,” I told him. “Are you sure? You might not like it,” He warned. “I probably won’t,” I agreed. That was the perfect plan. I didn’t (or couldn’t) see anything wrong with it. This first place cost us 5USD per night per person. This included breakfast and a fresh towel each day. We checked the reviews and everyone loved it. It had something like a 4.8 out of 5 rating. Our train got to Nha Trang 2 hours late. By the time we checked in and got to the room all our roommates were fast asleep. We couldn’t find the locker that is practically standard with many hostels. Not wanting to wake anyone up, we just put our packs on the floor and climbed into bed. We would sort everything out in the morning. At 4:30 in the morning I dreamed that I was being chased by a trumpet. I couldn’t get away from the possessed instrument. I ran as fast as I could, but it just played louder and louder. Then I woke up. The trumpet was real. It wasn’t being played very well. “Who is practicing music this early in the morning?” I wondered as I tried to will myself back to sleep. It was still dark out. I hadn’t slept much that night. My bed was very squeaky. Every move I made caused the bed to make noise. Whenever I changed positions the noise woke me up. And just as I got so tired I could sleep through the squeaking, I was woken up by Reveille. Because, the lockers were tiny. It was a set of eight 1X1X1ft3 lockers, the size you would find at an overly crowded high school. You could not fit your whole pack in these lockers. Everyone had to choose their most important items and hopefully they were less than 1 cubic feet. The window was a reasonable size had this been a bedroom for one. But it was way too small for 8 backpackers with damp towels and wet swim suits to air out. This left a permanent musty smell in the air. I hung my head down from my top bunk bed to see what Mark was doing below. He was already online looking for the next place. He motioned me to come down and join him in his bunk. I sat next to him, pressing my hand on the wall to stop the bed from squeaking. “This was the highest rated hostel in the area,” he told me. “I think we should try a hotel next.” I agreed. We went upstairs for breakfast. Every hotel and hostel does breakfast a little differently. Some places do things buffet style. In others, you have to choose one or two dishes. We stood in front of the food waiting for a staff member to tell us what we should do. We asked a lady who looked like she worked there. “You have to pay 2 dollars,” she told us and waited for the payment. “I thought breakfast was included,” I said. “Not for the first day,” she explained. “Tomorrow it will be free. Today you must pay.” She put her hand out for the cash. “Last night around 11pm,” I told her. “Breakfast is included,” the coworker told the first lady. Then she turned to Mark and me, “Just eat what you want. It’s a buffet.” Then she motioned for us to get plates and eat. The first lady apologized. “I didn’t know you checked in last night,” she said with a phony smile. It turned out that the beach was, in fact, a 10-minute stroll from the hostel. We spent most of the day there. It was a very nice beach; crowded, but very nice. Many vendors peddled their wares along the shore. You didn’t have to leave the sand to buy food or water. Hell, you could buy sunglasses from right in the water! The next day, I talked to the lady who saved me from getting scammed. “Are you checking out today?” she asked me. She looked at me a little dreamy-like and asked, “Where are you going next?” She seemed to live vicariously through the backpackers. The hostel did run a bar from 6 to 10:30PM. It was also next to many other bars. They specialized in a bucket cocktail which was very cheap and could be shared with many friends. This meant that there was always someone left to finish an only partially consumed bucket. That person would usually wake up in an alleyway the next morning not remembering the night before. At the hostel we paid 5 USD per night per person or $10 a night. The next place, a hotel, cost $20 per night. We were living it up for the next two days! The new place came with a pool, but we still swam mostly at the beach. And best of all, there were no military schools anywhere near the hotel. We did have the cheapest two person room in the hotel. This afforded us with a great view off the fanciest hotels with a view of the beach. We could look at their guests looking at the beach and it was amazing. The story could have ended here. Mark went online to book more days, but there were no rooms available. Thinking that something must be wrong he went to the reception to sort things out. He came back dejected. We didn’t know it at the time, but that weekend was a big holiday. All we knew was that all the hotels in town were sold out. Nothing in our price range was available. Everything a few steps above our price range was taken. Rooms several steps above that were all gone. All that was left were rooms that cost a several hundreds US dollars a night. That was out of the question. There was one option left to us. If we took a taxi and went a little outside the downtown area, there were a few more hotels to choose from. It’s still Nha Trang, just a 20 minute cab ride away. Mark found us the cheapest room in a fancy hotel; a beach adjacent hotel. How long did it take to get to the beach? It was just across the street. Is it raining outside? I have no idea. So what is the cheapest room in a fancy, beach side, non-downtown hotel like? It was $50 per night and had no windows. Yup, no windows. We were also on one of the higher floors, but it didn’t matter. We had no view. If we did have a view it might have looked like this. This photo was taken on the third floor. This beach here was even nicer than the one downtown. It was quite similar, yet not as crowded. The hotel provided beach chairs, big shady umbrellas, and beach towels. The best part of the hotel though, was the amazing breakfast. It was a buffet that took up half of the second floor and it had everything. There was a bread station, a coffee and tea station, an egg station, a rice and noodles station, a cereal station, a juice station, a fruit station, and a dessert station. Did I leave anything out? So, how did I like the different hotels? 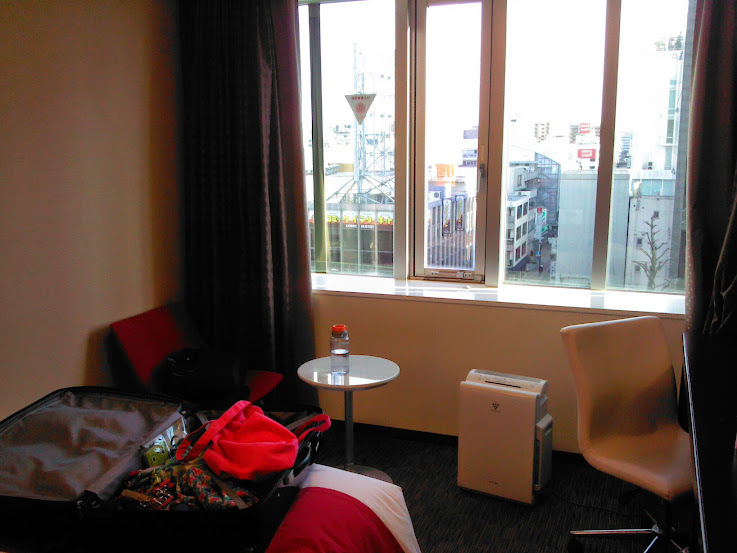 I liked the mid-range hotel the best. If the hostel were clean and quiet I would have liked that one. I really like saving money, but not to the point of being too uncomfortable. The fancy hotel had the best amenities, but I did not like not having a window. It was difficult waking up. If we stayed there long enough, we would have had to start using an alarm. RTW Trip Rule #2 When in Country A eat only Country A’s Food. We’ve made some rules for ourselves. They help us to better enjoy our year of traveling. The first rule is to avoid, whenever possible, taking taxis to or from airports. This is a very good rule that saves us a lot of money. The second deals with eating exotic foods. Just don’t do it. It always leads to disappointment. For example, when in Japan stick to Japanese food. Don’t fly all the way to Japan to eat in a French restaurant. French food in Japan is expensive and it won’t taste like real French food. Maybe if you go to a very expensive and posh restaurant they might serve authentic French food, but that’s beyond our budget. Besides, we can have French food when we get to France. Sometimes there is a gross misunderstanding about what the food should taste like. Once in Busan, South Korea Mark and I went to a Mexican restaurant. There was a picture of “nachos” on the menu. It looked very delicious, so we ordered it. When our plate of “nachos” came it looked a little off. I tried it, picking up a chip, sliding it across the plate to get some cheese and toppings on it, and popped the chip in my mouth. It was awful! What should have been cheese was honey mustard. These fools at the restaurant probably only saw a picture of nachos and assumed what the ingredients were. It was an all around huge mistake. But still, the urge to have familiar food still pops up every now and then. Mark saw a menu for a place calling itself, “Pizza King”. It had photos of the pizzas it offered. I had to admit, the pizzas looked good. I was curious. Sometimes, in Vietnam, the photos of dishes are found online, and are only a representation of the food you get. In a photo there is a lemon or a salad, but the dish comes with no lemon or salad. So, I wondered how close to the picture the actual pizza was. We went inside and Mark ordered a sausage pizza with extra cheese. Below is the culinary abomination he was served. We took the yellow public bus #01 from Hoi An to Da Nang and took the train from there. The train ride was pretty uneventful except for one thing. Mark and I shared a berth with an old guy from North Carolina, but he spent most of the ride getting drunk in the dining car. Eventually, he stumbled back to the cabin, crawled into his bed, and asked us to wake him up before the next stop. Mark and I agreed but wondered how we would know when we were about to get to the next stop. It didn’t matter; the guy never stopped talking long enough to fall asleep. He rambled on about this and that but mainly stuff that didn’t make any sense. Somehow in our mostly one-sided conversation it came out that Mark and I had been playing cards earlier on our train journey. “Oh, I can play cards… mumble mumble mumble.” He insisted that we take out our pack of cards and allow him to show us how great he was at whatever game we were playing before. “Rummy,” we kept reminding him. “Gin Rummy is a different game.” I had also never heard of a “Monte Carlo” version of Rummy, but I’m no expert on all card games. It’s just that Rummy is a game that church ladies happily play. It’s not exciting enough to have a Monte Carlo version. I think he just wanted us to think of him as a “high roller”. “You know,” he started staring up at the ceiling to let old memories come back to him. “You know who used to try to cheat at cards? All the time… ALL THE TIME!” Mark and I had no idea where this was going. But since we didn’t really want to play anyway, we humored the drunk geezer. “Willie Nelson!” He shook his head recalling past events. “Is that a cousin of yours?” I asked. Surely, he couldn’t mean THE Willie Nelson. We had heard of Willie. Who hasn’t? But even if we didn’t we would never admit it. If we didn’t know who Willie Nelson was, we might have to go back to playing cards. I wasn’t sure if Mark and I were playing the same card game he was. “How did you find yourself playing cards with THE Willie Nelson?” I hoped that that question would get him to put down his cards. “Oh I was a back-up singer for him. That was before I retired. Willie, Aretha…” Then he listed a million names of people I had never heard of. “I wrote some songs too,” he boasted. “Have you heard…” he said something unintelligible. I asked, “What?” It started an almost endless loop of him mumbling and me asking, “What?” about 10 times. I just gave up and admitted that I was unfamiliar with that particular ditty. “No!? This generation. You don’t know the greats…” He mused about the passion needed to make a good song. It was something that today’s singers and song writers apparently lacked. He tried naming other songs he wrote, but I hadn’t heard of half of them and the other half, I just didn’t understand what he was saying. I almost wanted to tell him that I have never concerned myself too much about music or even the latest releases of even the biggest current singers. But, I liked that he thought that I didn’t know about the songs of the previous generation because I was too young and not because I was uncool. Suddenly he stopped reminiscing. He picked up his cards again and asked, “What do, what do, I, I do here?” Mark and I gave each other looks. I didn’t want to play cards. And I didn’t want to explain the game to this drunk chatty guy. We wondered how to get out of this game. Neither of us wanted to continue. But then the train slowed down. “Hey, it’s your stop!” I tried not to sound too overjoyed. He was so grateful that I reminded him when his stopped approached that he felt the need to give me some gift. He opened his bag, searching in it for a long time, and pulled out a squashed avocado. He sniffed it then handed it to me. I took it, quizzically. “What the hell am I going to do with this?” I asked Mark after the old song writer left.